This month Sam, of Becks and Posh is hosting the 4th Dine and Dish – Be Rachel Ray for a Day. Now I love these events in any case, but was compelled to join this one as, some time ago (I’m almost afraid to mention it…) I had (to some) the audacity to say that I didn’t want to see any more Rachel Ray shows (not that they had to cancel any of the current shows!) and I thought that some of her methods/recommendations were – ummmm – not that sensible, maybe? And one of my pet peeves was that on her travel show, $40 a Day, she is penny-wise and pound foolish, often traveling rather far (and thereby increasing her transportation costs) just to save a buck or two on dinner. Additionally, she’s a lousy tipper (brought up by several commenters from the food industry on the post – not just me!) and in my opinion, if you can’t afford the tip, you can’t afford the meal. I actually quit dating a guy once because he was such a bad tipper! Well, that and the fact that I didn’t like him that much anyway – but the tipping was a big part of that! I think it says a lot about a person. And being a former cocktailer, server, bartender myself I have a soft spot for servers – especially those who treat me well or overcome negative circumstances (too many tables, slow kitchen, etc) to do their best to make my time delightful. Another thing that I thought was a little unrealistic was that Rachael usually doesn’t include alcohol in her budget, or she may sneak in one drink here or there. Now, alcohol is not necessary but I think that most people, while on vacation, on likely to include it as part of the relaxation/celebration that a vacation brings. Anyway, when I saw this theme I thought it was high time I put my money where my mouth is (or fingers are) and show that I could eat easily and well, on $40 without sacrificing another part of my travel budget! Sam has given us the rule that since tipping habits vary worldwide that we did not have to include tips. I’ll tally my expenses without tips first, so that the post is comparable to others but then I’ll tell you where I would have included tips, how much and why because I think it’s very important. Especially if you are trying to learn about tipping. I’m basing this on the premise that I’m staying in downtown Seattle – a pretty likely scenario if you are traveling to the area. And, in fact, there are times I just check myself into a hotel and play tourist in my own town – I love that! I actually see things that I miss in my everyday wandering around. A couple of other notes. I’m going to add tax to all purchases, even though sometimes the tax is already included in the price. It just makes it easier for me to be consistent. I’m going to use a flat 9% (I know, it’s robbery!) even though rates around Seattle vary from about 8.7% to 9.3%. I think anyway, I don’t really pay attention to it anymore, as it drives me crazy. As mentioned earlier I’ll make notes about tip and add them in at the end but to be consistent with other entries I won’t include them in the ongoing tally. So what would a tourist do? One of the nice things about Seattle is that many of the tourist attractions are places that those of us who live here use or enjoy, too. Since I want to spend a little time exploring Pike Place Market, I’m going to head there and see what I can find for breakfast. The locals tell me there’s a great little French bakery right on the main street. Not only do they have wonderful bread and pastries but they have casse-croutes, a typical sandwich you’d find in boulangeries and féuilletes, a pastry filled with various items – sort of a meal in a puff pastry shell. The bakery is called Le Panier. It is right on Pike Place directly across from the main market. I enter the bustling shop, go to the counter to survey my options – there must be at least 10 varieties! – and choose a Pate de Campagne. The price for any of the sandwiches is just $5 and these are very generous sizes! I order a cup of tea to accompany the sandwich, make my way to the counter in the front window and spend the next hour, munching on my sandwich, sipping my tea watching the procession of locals and tourists drifting by the window and occasionally glance at one of the free papers I picked up on my walk from the hotel. I also set a loose itinerary for the day – spend the morning in the market; then check out the waterfront and have dinner somewhere close to the hotel. Tip note: Since this was a walk-up counter and I carried my own meal to the table this doesn’t necessarily warrant a tip. However, they did have a tip box near the register and the staff will bus my dishes so I toss my change in the tip box. Other alternatives: If I’d chosen a féuillete instead of the casse-croute my bill would have been less than $5. And, actually, this sandwich is too large for me to eat in one sitting so I’d probably split it with a traveling companion or save 1/2 for lunch. I also may have chosen to eat at Le Pichet (another French place!) on First Avenue just up the block from the main market. One of my favorites there is the brioche. When they have it, it’s about $3. With a cup of tea or some sort of coffee and you have an ample meal! Le Pichet has sit-down service so a tip would be required here, but at 15% – 20% we are only talking a $1, although I’d probably leave $2. If I wanted more of a bacon and eggs breakfast, I’d probably visit the Athenian Inn in the main market. The food is not great but it’s certainly good. Plus it’s reasonable and this is the Sleepless in Seattle place where Tom Hanks is trying to figure out how dating works again. Also, I may have picked up my coffee or tea at the Starbucks here in the market. It’s the original store. It was here before Howard Schultz was even thinking about coffee. If nothing else I need to swing by to take a look at the original (slightly risqué!) logo! And there’s always some sort of busker in front playing some sort of music – many of them are amazingly good! I spend the next several hours wandering in and out of places in the market. It’s a fascinating place! Even though it’s a big tourist draw this is a real working market! I see lots of locals doing their shopping, talking with the stall owners and making their way with purpose through the crowd. As for me, I’ve heard about a couple places here that I really want to check out. The Spanish Table located on Western Avenue on the backside of the market carries all kinds of Spanish and Portuguese foods and culinary tools. You should see the size of some of the paella pans they have! And the wall of Spanish wines and Ports – amazing!! They say it’s the largest selection of Spanish and Portuguese wines in the US. Just down the street is the World Spice Market. They have a huge selection and they prefer to sell you whole spices to grind at home, but will grind them and vacuum seal them if you really need them to. Back in the main market is DeLaurenti’s – not necessarily a bargain shoppers paradise but they certainly have a huge selection crammed into a little space. And the cheeses are wonderful! Walking through the stands of local farmers and their goods is quite an education, too! I see all kinds of things brought to this area by various ethnic groups who have moved here over the years. I could go on and on, but you get the idea – the market is not just tourist fluff, it’s a real market. No wonder it’s the heart and soul of Seattle! Well, I’ve been wandering around, looking at all this food and although I’m still pretty full from my breakfast, it’s time to take a break and rest a bit – maybe have something refreshing, something Seattle. What says Seattle more than something from the sea? I had noticed a seafood shop that also had a little lunch bar on the back side. It was in the Sanitary Market – on the east side of Pike Place. They have a little bar where I can sit but it’s such a nice day, I’m going to get my meal to go. I make my way to Jack’s Fish Spot and queue up for something from the counter. I decide to go with a shrimp cocktail – an extremely generous serving of baby shrimp, fresh crispy celery and Jack’s homemade cocktail sauce. When I see what they hand me I can hardly believe it’s only $3!! If I had been a little more hungry I might have gone for the clam chowder at just $4 for the bowl. I take my seafood treasure and walk up the street towards the park overlooking the water. On the way I stop into the little grocery market to pick up a bottle of water. I choose a bench in the park and take in the view of the Olympic Mountains and the ferries criss-crossing Puget Sound. The water sparkles, the sun is warm. This is life! Tip note: Again this was a walk up place and I took my meal to go. I’d probably throw some change into the tip jar if they had one. The water was purchased at a grocery store so no tip required. Other alternatives: Pike Place Market is full of little places that are great for picking up a little something to take to the park. I might have chosen Hum Bow from Mee Sum Pastry ($2.06 – 2.76 before tax) or one of the many varieties of Piroshky at Piroshky Piroshky ($2.75 – $3.75) or maybe a little treat from the Greek Delicatessen. If I wanted more of a sit-down lunch I would have stopped by El Puerco Lloran on the Hillclimb steps. This is a GREAT Mexican restaurant and a very generous meal will run you about $6 or $7 plus tax and tip. 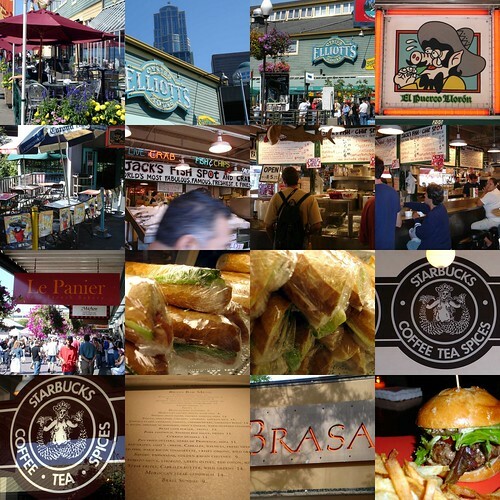 For information about many of the fun little places in the Pike Place Market, check out this article from the Seattle P-I. It’s a couple years old but still accurate. A note about the park – it’s called Victor Steinbreck Park and can be a little scary looking your first time there. This is one of the areas of the city where a lot of homeless people congregate. While I wouldn’t wander around in the park on my own late at night, I’ve never been bothered there at any time during the day – even the early morning – or into the evening. If you look closely you’ll see that people on the benches and walking through the park are from all walks of life. You may be more comfortable choosing a bench or area filled with business people or tourists to start with but you’ll soon see you have little to worry about at all. In fact, many of the homeless will greet you and wish you a good day – too bad the "normal" people are too reserved to be as friendly! After finishing my lunch and resting my feet for a bit, I find one of the skybridges that cross over to the waterfront or I make my way down the steps of the Hillclimb from Western Avenue to the Waterfront. Again this is a tourist area but there is much here that is of real value. Right across the street from the Hillclimb is the Seattle Aquarium. This is a beautiful and educational aquarium featuring mostly local sea creatures but you can also find the unusual here. One of my favorite parts of the aquarium is the underwater dome. You can sit in this area and watch the native species swim and interact as they do in nature. Technically they are in a tank of sorts – while the dome is under the Sound the fish are kept in the area by a net that you can’t see. This is a huge exhibit and you’ll see octopi, small sharks, bottom feeders, and all manner of fish behaving exactly as they do in the wild – because technically that’s where they are! This is a really peaceful and beautiful place to spend a little time – the longer you stay the more you see, as the fish that at first blended in to the surroundings become easier to spot. There is also an interesting Maritime Museum on the waterfront; you can sit and watch Parasailers; walk along the water to Myrtle Edwards Park; hop on one of the trolley cars to get from one of the waterfront to the other; visit Ye Olde Curiosity Shop to see the mummies (okay this is pure tourist…); or maybe the best thing – pick one of the many options to get out on the water. Besides the aforementioned parasailing, you can take an Argosy Cruise around the working waterfront or through the locks into the fresh water lakes and back again; you can jump on a 70′ sailboat for an afternoon or sunset cruise; you can take one of the Washington State Ferries across the sound (30 – 45 minutes depending on which route you take) and then take the ferry back on the return trip; during the summer months there is a water taxi that departs for West Seattle where, once you land, you can take the 15 minute walk west to Alki Beach and see one of the best views of the Seattle skyline. Lots of possibilities and all of them give your weary feet a rest while giving you some of the best views of Seattle. Around 3:00 I’m getting ready to wind down for the afternoon. I’m thinking, I’m on vacation and it’s time for a cocktail! Since I’m on the water I head to a place that I’ve been told as a great Happy Hour – Elliott’s Oyster House. 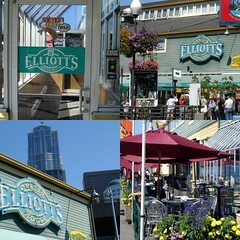 Although Elliott’s is on the Waterfront, in the midst of what many consider pure tourist area, it is actually part of a great local chain of restaurants. Known for events such as the "Oyster Olympics" it has a noble history as a fine seafood establishment. One of the best things I like about it is the "Progressive Happy Hour"! Happy Hour starts at 3:00 pm. There are a few drink specials – most notably some decent martinis for just $3; some bar type snacks at reduced prices; and finally specials on oysters on the 1/2 shell. Now this is where the "progressive" part comes in! From 3:00 – 3:30 they are 50¢ per oyster. From 3:30 – 4:00 they are 70¢ per oyster. At 4:00 they go up another 20¢ and so on until Happy Hour ends at 6:30. Now this is a perfect deal for a woman on a budget! I enter Elliott’s at 3:00 and slide on up to the bar. I ask what the oyster of the day is – this is just for curiosity’s sake as I’ll order them whatever they are since Elliott’s only serves luscious oysters. I order a 1/2 dozen of them and they are served with their frozen champagne mignonette – oh my! To accompany my oysters I request a vodka martini with a twist. Sitting back I take in the sights and sounds of the surrounding area. I sip and slurp my way through my afternoon snack. Completely satiated I return to my hotel to freshen up for the evening activities. A little dinner and then a visit to a local jazz club are on the list for the evening. Tip Note: This is defintely a tipping situation. While 15% is often considered standard, I think 20% should be considered at all times. And, in a case like this, where the food and/or drinks are substantially discounted I always consider what the tab would have been if it wasn’t Happy Hour – it still takes just as much effort to serve it at 1/2 price as it does at full price! In this case I would at least tip $2 but more likely even more. Remember – you got a great deal on the food, so you can afford to be a bit generous if your service was good. Other Alternatives: Ivar’s on Pier 54 also has a good Happy Hour and it is a Seattle institution. The first time I ate there I was 12 years old and I had baby prawns and chips – a huge plate and they were great! Anthony’s on Pier 66 also has a Happy Hour upstairs. The food is great but the Happy Hour specials are not as good a value. I’ve been back to my room; I’m feeling refreshed and now I’m ready to head out for the evening activities. First stop Brasa, which is a short walk from my hotel. Brasa has a great Happy Hour menu. All food on the bar menu is 1/2 price and the bar menu is extensive, the food substantial. I decided to order a lamb burger with frites and a glass of wine. The Happy Hour price for the burger is $6 and the wine is full price at $8. ($8 is actually a median price – you’d be able to get many of their specialty drinks or a glass of wine for this price. Tip Note: This is defintely a tipping place. Since 1/2 my meal was at Happy Hour prices and 1/2 was at full price. I’d make sure I left a generous tip, probably $4. Other Alternatives: If I wanted to see a little different part of Seattle, I might have taken a taxi to south Lake Union to one of the restaurants there. Taxi fare to this area is going to be maybe $8. Daniel’s Broiler has a great Happy Hour. Similarly everything on the bar menu is 1/2 off and house wine (which is a decent brand) is $3.50. Chandlers, also on Lake Union has a similar deal. McCormick and Schmick’s has a $1.99 Happy Hour food menu, which includes a 1/3 pound burger and fries, among other things! They have a location downtown and on Lake Union. If I wanted to stay downtown I may have gone to Cascadia. Their Happy Hour menu is limited but the mini-burgers at $1 a piece are great! A couple of them and an order of Happy Hour Calamari and a Happy Hour cocktail and you’re set! The amount of food I "ate" in this day is more than I actually could/would eat in a day but I wanted to make sure that all meals were covered. In real life my total for this day probably would have been closer to $30 and I’d take my "leftover" $10 – maybe from a couple of days – and one night have a big fancy dinner but my average spend for the vacation would still have been under $40. For "today" my remaining $6.64 would just about have covered my tips if I’d included them. Since, for this exercise, we didn’t have to I’m going to take my remaining money and head to The Triple Door, where I can sit in the lounge and enjoy the music being piped in from the showroom below (or even attend the show) and have one final nightcap. Then I’ll return to my hotel happily tired and ready to sleep well. I miss Seattle tons and agree with your suggestions. I have been to all those places. 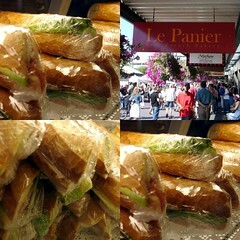 I love the Palmier from Le Panier and miss the mini donuts from Pike Place Market.